There are times when there’s just too much light! Sometimes it’s too much for our eyes, and we need sunglasses. Sometimes, it’s too much for our photography or cinematography. For these times, we can employ neutral density filtration, which is like sunglasses for cameras. Filtration normally suggests allowing some things to pass, and some others to be turned away or eliminated. Color filtration does this by allowing one or more colors to pass (the filter being transparent to those frequencies of light) and blocking others. Filters that appear purely red do so by blocking most everything else but frequencies in the 600+ nm bandwidth. As the name implies, a perfect neutral density filter has no color bias or color character at all. It blocks all visible frequencies of light equally. Its purpose is to reduce the light energy in its path. Utilizing it predictably requires exposure changes, affecting our exposure settings. A neutral density filter is a useful tool to engage when the light source cannot be otherwise modified, and less light is needed or desired for a given subject or condition. It allows for either a wider aperture or slower shutter speed than would have otherwise been required. One of the most common uses of this type of filter is to intentionally allow for very long exposures during bright sunlight or even mid-day overcast lighting. Such applications include rendering a busy populated scene into a still life…having a shutter speed so long as to blur all activity (human included) into invisibility. Another variant of this would be to make a seascape as placid, with the waves and turbulence of the water made to appear as calm and flat. Yet another would be to use a moderately slow shutter speed capturing a waterfall or stream, so as to have the motion blur suggest or show movement. Three images using a variable neutral density filter as exposure control. 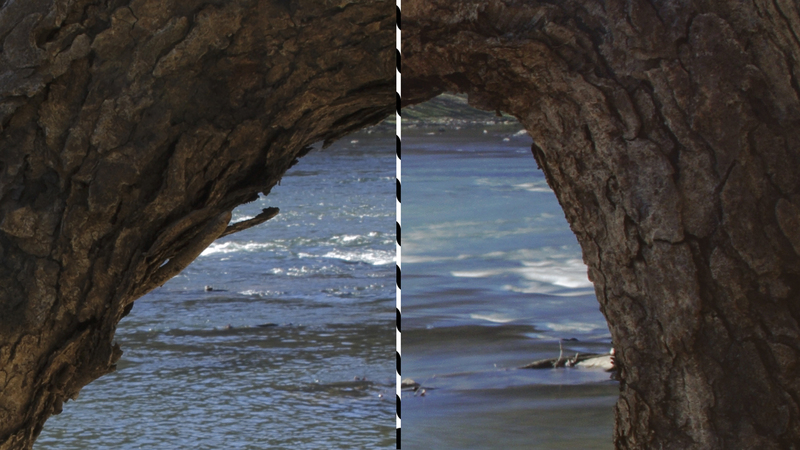 Left image: 1/60th sec ƒ/9, Center: 1/6th sec. ƒ/9, Right: 5 seconds ƒ9. ND Filter used was a Tiffen Variable ND. In the most extreme cases, the use of a neutral density filter is absolutely invaluable when photographing an impossibly bright light source, like the blinding light of an arc welder, or the sun itself (see previous articles on photographing the eclipse of 2017!). Its use can be essential for the safety of the camera’s sensor and our eyes as well. Partial Sun! During the total eclipse of 2017, a 16 stop ND was mandatory during the partiality portion of the event, as the sun would still be bright enough to cause permanent eye or sensor damage. This tool is perhaps even more important in the cine craft, as the shutter speed for movies is a far more limited control than it is in still photography. To duplicate the smooth effect of human vision, a shutter speed of approximately twice the frame rate is typically employed. If the frame rate were 30 frames-per-second, then the recommended shutter speed would be 1/60th second. Shorter than this and the action appears stilted, and this restricts that exposure control. Keep in mind our typical daylight exposure limits by using the “sunny 16” rule as the guide (Use the reciprocal of the film/sensor set speed as the shutter speed at ƒ/16). Even at a low ISO of 100, that would suggest a shutter speed of 1/100th sec at ƒ16! Using a aperture of ƒ/8 would demand a shutter speed of 1/400th sec.!!! How do we somehow get to 1/60th? This constraint begs for the control of an ND, or neutral density filter. In some cases, we might want to open our lens to its widest ƒstop to have the least amount of depth-of-field possible. In addition to shutter speed, aperture and ISO settings we have for controlling exposure, the ND filter allows us to re-set the ƒ/stop range while the other controls remain constant. In digital photography, we have three primary controls over exposure. When using film, only the first two were primary controls; ones that we could directly engage for each and every exposure. Using cameras that utilized interchangeable magazines allowed for an ISO change via a different ISO film in a new back. But this was limited to the film types we might have on hand, not to mention the complete lack of ISO speeds over 3200. Digital photography freed us to use ISO as just yet another exposure control. But even with this technological flexibility, there are still times when we might need yet another control or option. Most digital cameras have a sensor/processor native ISO, where the image fidelity, noise, dynamic range etc. are at their best. These typically hover at ISO 160-200!! Should we need a slower ISO than that native speed (or even the camera’s lowest setting), sometimes the only solution is to block the intensity of our light source. Not that long ago in our film days, we regularly had the use of ISOs of 25 or 64 (like Kodachrome), settings that don’t exist on today’s digital cameras. But we can achieve these cameras settings that were used for ultra low ISO films with the use of an ND. There are also some lenses that do not have aperture settings, such as the Catadioptric type or mirror telephoto lens, which use a mirror as their primary optical element. ND filters can become a very important set of exposure tools for this type of photography. Almost all current lenses function best at least 3 stops down from their maximum ƒstop. Stopping a lens down smaller than ƒ/11 usually ventures past the lens’ diffraction limit. Simply put, diffraction is the perceptible effect of the breakdown of coherent color rays after that iris limit. It’s caused by the bending of light adjacent to the iris itself (or any opaque material). While it may seem that small ƒ/16 to ƒ/22 settings will make sharper photos, it’s actually going to degrade sharpness, even though we will be capturing greater depth-of-field. If you have a need to achieve the very best optical performance from your lens, it might be necessary to mitigate the brightness using ND filters. There are basically two methods of creating ND. The first and most common is the absorptive type using a dye in the transparent medium (mostly glass). Because the dye is uniformly distributed within the glass, the thickness of the filter must be extremely controlled and consistent in order to ensure uniform density across the entire filter. There is also a “Reflective” type, which typically relies upon a metallic coating to the surface of the filter. If high heat is used in the process of metal deposition, these would be typically made of glass. The coatings can be engineered for specific frequency ranges, which can be “neutral” in any bandwidth range desired. Aluminum can be deposited on clear polyester film, creating a very flexible type of ND filter. Some refer to this as mirrored “Mylar”, which is a brand name for Dupont/Teijin Film Enterprises biaxially oriented polyester film. Same thing. A variable Neutral Density filter is a couplet of two Polarizing filters which when rotated against each other increase or decreases their light blocking properties. The advantage of this tool is huge flexibility in one filter installation, with a typical 2 to 8 stop range of ND! Some of them have a smaller range to mitigate one of their disadvantages, referred to as “blue light leak”. At the darkest setting, most of the crossing Polarizing filters allow some of the shortest visible wavelengths to pass more than the longer ones, biasing the color towards blue slightly. Even a single Polarizer adds neutral density, and if you regularly keep one in your kit, you might find it useful to employ it as such. Most Polarizers add approximately 2 stops of neutral density in addition to its primary purpose. A Graduated ND filter is one that has a gradually increasing density across the filter. This is a very useful tool to block more light from one part of the subject than another, such as the range of light in the clouds of a sunset sky as compared to the darkened foreground. This is not as common in today’s photography, but when very wide-angle lenses exhibited pronounced light falloff at the periphery, a “center” filter (another name for the Center ND) could correct this undesirable characteristic. Ultimately, Neutral Density is an efficient additional exposure control. These “sunglasses for cameras” free our imaging options in a way that cannot be replicated with the existing controls on our cameras.